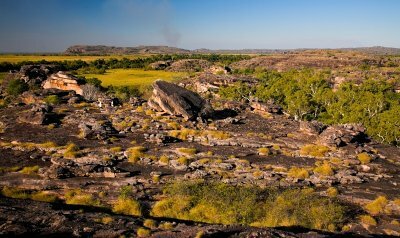 Kakadu is presently very dry as you can see, and would probably be at it’s best around May just after the wet where there would be more water. The wet and dry season here is much more clearcut than in Queensland. It hasn’t rained here since May, everyday it’s a perfect minimum 32c degrees and sunshine from a clear sky and wetlands are arid. 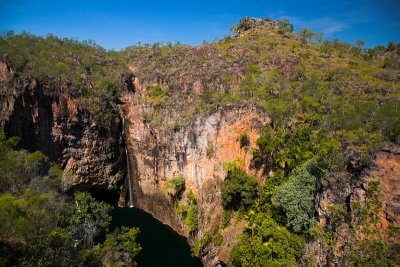 I have experienced Kakadu in the wet season with large flooded wetlands and it is a phenomenal sight – the fauna and the wildlife is overwhelming. The amount of mossies, flies, sandflies and the humidity (and cyclones!) is also very overwhelming in the wet! It is so spectacularly uncomfortable that if you’re not a Territorian (born in the Northern Territory) it cannot be described – has to be experienced. I am glad to have seen and experienced Kakadu in the wet (still remember the hundreds of mosquito bites from back then), but prefer the dry where it’s more livable for us tourists! There’s still billabongs and wetlands, we did a cruise on Mary River and that’s still flowing (nowhere actually, it’s not a river really, Australians are so good at naming things :D). See the croc picture later. Like I wrote earlier, it’s at least 32c degrees everyday, you see maybe one cloud a day and the sun is unrelentlessly baking you from a clear sky – everyday! It’s actually far too hot to sit in the sun for very long (sorry to make the sun-deprived Danes even more summer-depressed). Pale scandinavians like myself become positively transparent in the strong sun down here but I do now have a somewhat different colour. It’s quite possible it could be called a good tan, at least in Denmark. It’s brownish/reddish with some small red spots and some large red spots. Small red spots are sandflies bites, big ones are mossie bites! Mossie bites are big, itchy like crazy but last a day or two. Sandflies bites are smaller, not as itchy but stay for 4-5 days! The polarizer filter is permanently on my most used lens. It is needed all the time here in the territory, to remove glare and reflections and bring some colours back into what would otherwise have been completely burned out pale tones. On tours like these you have to take what you get and you have limited time for photography. But it’s still great fun and I couldn’t and wouldn’t want to walk around a huge National Park on my own (fall off a rock and no one would ever find you). I’ll end with a shot I took of a nice saltwater crocodile from a cruise on Mary River we did – click for full size, and click here to see more on my website. 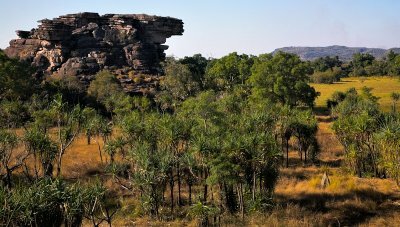 I am off again to Kakadu tomorrow, this time to Arnhem Land – the closed part of the park where you need permits from the aboriginals to enter. See ya! No words will suffice. Mindil Beach sunsets are food for the soul and I try not to miss one while I’m here. The tropical colours at dusk are something we never see in Denmark. No saturation added to this, and the red channel could surely use a lot more levels than the 12 bits provided in the raw file! Click the shot to see larger size on my gallery. 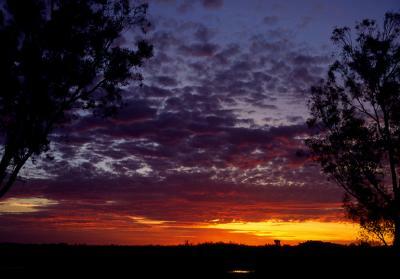 Now I promise to shoot something which is not a sunset – off to Kakadu National Park tomorrow! The first night is never a problem. I am always so incredibly tired from the trip (can’t sleep on planes) that I sleep great. A little too great, slept till 10am Friday morning. Wasn’t supposed to and that didn’t help with the feared night 2 where jetlag kicks in for me. Had to get up at 6am to make a 7am pickup for the trip to Litchfield and my body thought it was on CET+1 so of course…I feel asleep around 4am and got about 2 hours of sleep. I hate night 2! Friday I visited the brilliant MAGNT – Museum and Art Gallery of the Northern Territory. I get bored in museums generally but there are exceptions. Stunning displays of aboriginal art, natural history of Australia and a special section on Cyclone Tracy make this museums a must-see. Darwin has had a tough life. 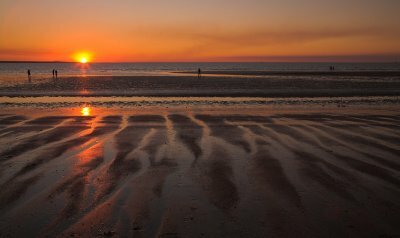 Darwin was bombed by the japanese in WWII and almost destroyed. And not once but twice has cyclones practically erased Darwin from the face of the earth. The worst natural disaster in Australia is Cyclone Tracy in Darwin in 1974 and at the museum you can learn all about it. Best bit is this pitch black room that plays the sound of Tracy (someone recorded parts of it when it hit Darwin) at very high volume. Standing there in the darkness listening to Tracy she comes alive and it is chilling and scary! Imagine winds at 217+ km/hour (that was the speed recorded before Tracy broke the equipment) mixed with flying debris like tonnes of corrugated iron scraping across concrete and hitting other buildings etc. Must have been hell on earth when she hit Darwin and very few of the house were built to withstand anything so the city practically disappeared. Speaking of WWII – Darwin had the distinction of being the only city in the world with an airstrip that crossed a railroad line! The army needed to extend this particular airstrip and only option was across a railroad line. So in typical Aussie “have a go” engineering fashion, it got extended across the railroad and the tower had to coordinate landings and takeoffs with the train schedule. The airforce pilots must have loved this! Monday I’m off camping in Kakadu National Park so tomorrow I am doing oh so exciting laundry – and relaxing. I tend to forget that sometimes. 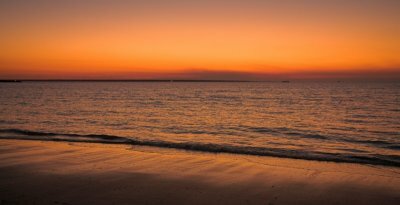 I’ll leave you with a sunset shot from Bicentennial Park in the city, sunsets are never ordinary here (and can include lots of biting sandflies as I found out sitting here in the park at dusk). Miss you all, hope you’re going great! Not really my words, it’s an Australian song (I Still Call Australia Home or ISCAH in short) and probably best known from the Qantas commercials (that can really move me…imagine that…me being moved…and by a commercial, video here). Anyway, it could be my words! I am here, and all is well and – ISCAH. I do still call Australia my second home and it’s amazing to be back in Australia. It’s like I never left at all. 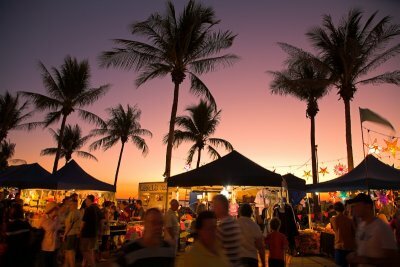 Half of Darwin was here, it’s a big market but it was packed and so was the beach at sunset. This sunset was beyond words, I didn’t even think it would be this good since we had no clouds all day – but the colour was magical and what a fantastic start to this photographic journey! I’ve only been to Darwin once before, for 1 day on a tour 9 years ago so it’s a bit like coming here for the first time and I like it more than I remember. I love the accent for one thing. The outback accent is much slower than the city aussie accent and they use a bit more aussie slang. I can really turn on my aussie accent mate and fit in no worries and howyagoin! It’s nice and warm here in the tropics! It was about 34c degrees today and hot enough to boil a monkeys bum Bruce (Monty Python again). Not that sticky but far too hot for jogging so today is not the day where this Gump gets to “run Forest, run”! I had a chicken burger + CHIPS of course for lunch. Can’t be helped. Chips are everywhere…must eat chips! I keep padding my pocket think I lost my mobile phone until I smile and remember I didn’t bring it at all and that I am not working so I don’t have to be on standby. 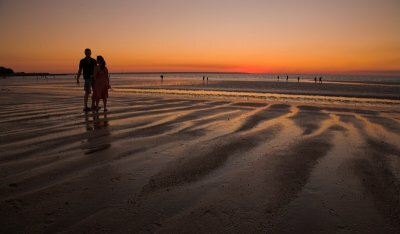 Everyone wears thongs (Australian for flip-flops) and most drive a ute and Darwin is really a good quirky outback big city and I mean that in a good way! 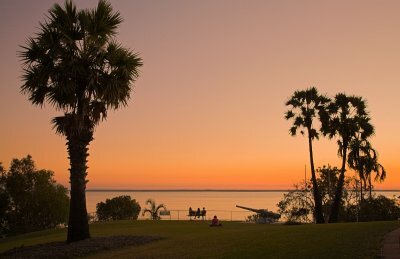 Darwin is also the gateway to the amazing Kakadu, Litchfield and Nitmiluk (Katherine) National Parks and they have the pleasure of meeting me starting Saturday! Keep your eyes peeled. It sounds and looks cool – “A New Beginning” – but it makes little sense. How many “old” beginnings do you know? Nevertheless this is exactly what I am doing. A new beginning. I’ve been waiting for this so long that the last few days before takeoff have actually been strange. Up until that point it’s just been me being excited about going. But packing my bags and it suddenly becomes reality. I am going away for a long time and I am starting a new job and who knows what with my photography business when I get home. I think I experienced every emotion I am capable of the last 2 days before takeoff and I was a bit nervous actually. Not about going to Australia but about disrupting my routines completely. My mind can run at lightspeed with many trains of thoughts at once and the only way to create stability in this chaos for me and stop me from going insane is everyday routine. Small things everyday that I know and like. I just threw all of that out the window! Well the good thing is I adapt as quickly as I think. And one hour in Copenhagen airport was enough to make all the difference and make all the worries go away. I was on my way (nevermind I was 15 Ks from home!) and happy and no worries mate! Sitting here in my hotel room in Darwin looking at todays pictures, typing this in my blog and watching “the footy show” on Channel 9 at the same time – all is well in my world! Last picture from Copenhagen for a while at least as I depart on Tuesday for the land down under! Preparing for my australian photo odyssey – and a solar powered mossie repellant! As of yesterday I am unemployed for the first time in more than 12 years. I have quit my job to go travelling and to challenge myself to try something new – after the trip we will see what the future holds for me. Bit of a weird feeling to not have to go to work. Not that I don’t have heaps of stuff to do, I am leaving for Australia on Tuesday and have to attend a family birthday this weekend so I’m keeping fairly busy. I did find myself at one point yesterday lying flat on my back on my sofa drinking Coke Zero and watching McLeod’s Daughters on the telly (see the picture and hey it’s an aussie show, takes place in the outback and I was a bit hungover, couldn’t be helped). Daytime soaps have me hooked already and I’ve been unemployed for one day only, bugger! Speaking of the outback, I got some wicked presents from my dear colleagues including an Ipod shuffle, the Sony GPS unit for geotagging my pictures and tracking my trip (or maybe they’re tracking me?) and a solar powered mosquito repellant that I am looking forward to testing in the outback! The little green box is a matchbox sized solar powered high pitched ghetto blaster! When switched on it produces a barely audible (not true, bloody annoyingly audible more like it!) very high pitched tone that according to the 32 page manual makes the mossies think I am a dragonfly! Amazing contraption! The manual goes to great lenghts to explain that since this is a solar powered device it will not work at night! (really?) But have no fear, this is where you light the small tealight citronella candle and stay mossie-free all night! (actually please don’t light candles for real in the outback…ever heard of bushfires?) Inspector Gadget would be proud and I will upload photos of the solar powered gadget in action in Australia soon – thanks Carina for definitely providing the funniest present! It is hard to describe the Australian Outback. You have to dream it. It is even harder to define where it actually is. You have to know it. But I know one thing: I absolutely love it! And I know when I am there. I feel completely at home when you stick me right in the middle of the outback, with nothing but nature and a lot of space around me. Something about this vast rugged millions of years old landscape draws me like nothing else. I may be a cityboy now but I grew up on a farm and that’s probably part of the reason why the outback is so sacred to me. I prefer big empty open spaces in nature and animals to big crowded cities and humans. 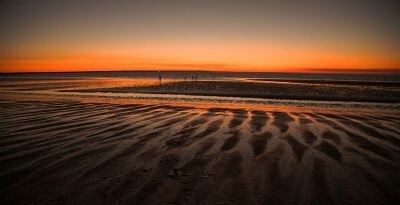 On the right is one of my photos from Outback Cape York, click to see full size. To Australians anything outside the main urban areas is “the bush”; at some undefinable point the bush then becomes the outback. Drive for many days through the outback and suddenly you enter the bush again and a few days later you may even come back to a city or the coast. Actually this is a fairly apt description of Australia. I would guess most tourists think of Uluru (Ayers Rock) or a stockman with a horse (Man from Snowy River style) like shown on the cover of OUTBACK magazine on the left when they hear the word ‘outback’. For me the following are important parts of my outback definition. Stations (Australian for a ranch/farm) in the Outback are absolutely huge and the nearest neighbor is usually hundreds of kilometers away. People stay in touch through satellite phones, internet, cb radio and kids get their education long distance through the brilliant School of the Air. In the North during wet season stations can be cut off from the world for months. So the station is a small village in itself, some with up to 60-70 people working and living there. The largest working cattle station in the world is Anna Creek Station in South Australia. It is larger than Belgium! It’s spread out over more than 30 000 km² and in comparison Americas largest ranch is only roughly 4000 km². In the great Australian tradition of being great at naming things a Stockman is someone who works on the station looking after the livestock. A jackaroo is a trainee stockman, a jillaroo is a trainee stockwoman! You also have to try bush camping. I am sure many people hate even the thought of camping in the middle of nowhere with no electricity, no showers, no toilets. But sitting around a campfire at night under a million stars, sleeping in a swag and waking up at sunrise to the sounds of the outback is an experience that cannot be matched. Again, impossible to describe you have to dream it. The Australian soil is the oldest on earth. No earthquakes or volcanos have pushed the soil around for many millions of years, so Australia is older than anything else and aboriginals have lived in Australia for at least 50 000 years (remember this when you think Australia has no history). The age of the land is very evident in the outback where you feel humbled by this ancient landscape that haven’t changed for so many years and feels strange yet familiar. Something so hard to describe is also hard to photograph. A single image cannot convey everything I love about the outback but I will keep shooting and keep trying. I doubt I will ever shoot the perfect outback photo but I can dream it and keep trying anyway (‘ave a go – as aussies would say). A few handy tips for shooting in the outback: use polarizer filters and adjust for reflected light. The light is so bright and harsh that taking your meter reading from the sky doesn’t always work, the reflections of the sun on rocks can be much brighter than the sky and it’s easy to get burned out highlights.